Are you looking for a live cricket score plugin for your website which shows the live cricket score and schedules of every match? Putting live cricket score to a site is easy. There are various API’s available for this work. RapidAPI and CricAPI also provide API’s through which you can get the LIVE cricket score. There are various plugins available for WordPress websites which help you to show live cricket news and schedule feeds directly to your wordpress website. What is Live Cricket Score Plugin? Live Cricket Score is a plugin which helps you to show the feeds of live cricket news directly into your wordpress website. There are various plugins which are available for free. You can use them to create your live score website. 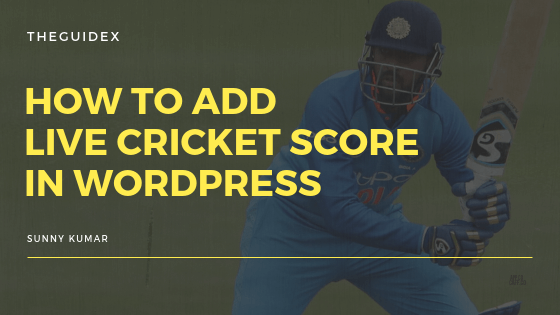 In this article, we will take a look at some of the best Live Cricket Score plugins in WordPress you can install now to take advantage of live match score directly to your WordPress site. Ultimate Live Score Plugin is an ultimate plugin for live cricket news. You can use this plugin to develop a cricket niche website with ultimate features. This plugin shows the complete details of the Upcoming, Completed and InProgress Series and Matches. Live score update automatically without refresh the page. ULCW also have a widget to show Upcoming, Completed and InProgress matches on the sidebar. In short, You have all the data to run full-featured cricket website. The Live Cricket Score plugin is a simple yet powerful plugin to add a live cricket score widget to your WordPress website. You can use this plugin to show live cricket stats directly to your sidebar. The score is fetched through CricBuzz RSS feeds and hence are always up-to-date and latest. Furthermore, you can also customize the color, look and the feel of the website to match your site color. It shows a score of the current match being held anywhere between any international teams. Even if there are multiple matches, it will show the score of all of them. JoomSport is an all-in-one solution for all of your sports score. You can use this plugin to show live feeds of cricket, basketball, hocket and a lot more sports games. This plugin has an active installation of more than 1K+ users with 5-star ratings. JoomSport offers the features essential for any sports site – sport league standings, fixtures, sports teams with the description, match history, statistic and photos, players with their profiles, photos, and personal achievements, matches with the score and game details, and finally, all this put into well-structured seasons and leagues. Responsive and professionally designed pages. Player profiles with photos and statistic. Venue page with maps and description. Team and player moderation (pro edition). Integration with Football live score API provider. Installing Live Cricket Score plugin in your wordpress website is easy. Here in this tutorial, I’m sharing the full guide on installing a plugin on your website. Then, click on “Add New” button at the top. You’ll now be redirected to the plugin installation page from where you can install thousands of plugin for free. Now search “Live Cricket Score” plugin in the given search box, and click on “install now”. After installing your WordPress plugin, click on the “Activate” button to activate the plugin on your website. Now go to Appearance > Widgets and drag and drop the “Live Cricket Score” widget to sidebar to show live cricket score on your website. There are various plugins available for adding live cricket score on your website. You can use various API’s available at RapidAPI or CricAPI to show live cricket score, or you can even use the above plugins to show the live feed directly to your website. These plugins are available for free, and some features are available only for paid users. You can use these plugins to create a cricket website for free. If you’ve any queries or questions related to these plugins, you can write your queries in the comment section below. Are you looking for a live cricket score plugin for your website which shows the live cricket score and schedules of every match? Putting live cricket score to a website is easy. There are various API's available for this work. Here I'm sharing the plugins which you can use to show the live cricket score in your website. Its Really nice and Helpful thanks dear.